Twilight's Kiss on Wild Rose Bestseller List! I'm hard at work writing the sequel to I'll Be Yours, and I have three other books in the works as well...that's me, when I get writing I love to multi-task. Oh, and I'm also part of a new exciting series at The Wild Rose Press. It's called The Legacy of the Brooch, and I will be writing the thirteenth story in the series, which is also the last story in the series, tentatively called, Journey's End. I'm the author representing the faery rose line in the series, so my story will be filled with romance, magic and more magic! You can find the link to the blog on my links list! It's going to be a fun year...my story is slated for an early 2008 release! Twilight's Kiss has been Released! 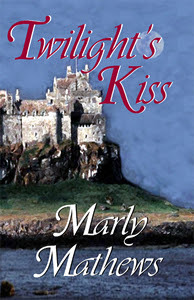 Twilight's Kiss has been released!!! It's now up for sale at The Wild Rose Press! New Banner for I'll Be Yours! Thanks to Glass Slipper WebDesign, I now have a lovely animated banner to use for promo for I'll Be Yours. I'm delighted with it! First Review from The Romance Studio for I'll Be Yours!!! Elizabeth Caulfield, nineteen year old daughter of super rich scoundrel Geoffrey Caulfield, was probably the richest girl around; that was not, however, the only reason she was kidnapped by a pirate named “Rafe” Mallory. She was unaware that he was the Duke she had met and fallen in love with ten years earlier. He was a distant relative, a member of the St. Martin family from whence late her mother hailed. She also did not know that, although he had a title, he had little money because her father had swindled his father out of everything in a card game. Mallory now commandeered a fleet of pirate ships to make enough money to support his mother and sisters. Elizabeth was not a hesitant, quiet young woman! She believed in doing what she wanted when she wanted to do it. She fought him from every angle, but she did fall in love with him; he still did not tell her who he was or that they had met previously. There are many characters that are outstanding in their roles; the plot is unusual to me because I usually don’t read about piracy. I am glad I had the chance to read this; it is an interesting story which definitely is strong enough to keep the reader’s attention. Of course, there are battles, trials of stamina and endurance, and more battles. The battles are related in an outstanding manner. The relationships of the couple, those of the men to Elizabeth, and those between the men are all interesting and carry the story farther along with their interactions. 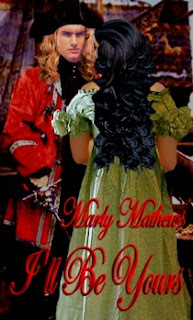 Ms. Marly Matthews has a writing style that enables her to describe battles and the interaction of love scenes so that even if violence is not your forte you will enjoy the book. The language and love scenes are not graphic, but allow the reader to imagine all sorts of things. I really liked the story and would recommend it to others who are readers of historical romance. Release Date for Twilight's Kiss! (Blowing Horn) I have a release date for Twilight's Kiss! It will be released in digital format at The Wild Rose Press on February 16, 2007. Tentative release month for the print version will be in April. :) So mark your calanders, everyone! Here's the blurb for Twilight's Kiss! 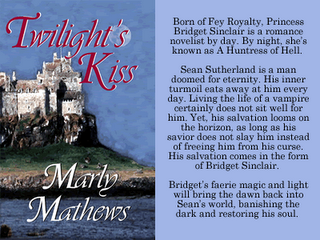 Born of Fey Royalty, Princess Bridget Sinclair is a romance novelist by day. By night, she’s known as A Huntress of Hell. Sean Sutherland is a man doomed for eternity. His inner turmoil eats away at him every day. Living the life of a vampire certainly does not sit well for him. Yet, his salvation looms on the horizon, as long as his savior does not slay him instead of freeing him from his curse. His salvation comes in the form of Bridget Sinclair. Bridget’s faerie magic and light will bring the dawn back into Sean’s world, banishing the dark and restoring his soul.